JUNE 2nd, 2018: Highway Clean-Up. Join the Friends of the Lower Blue River for their yearly Highway Cleanup. Invite your friend, family member or colleague. It will be litter removal along Hwy. 9 from 9:00 - 11:00 a.m. Meet at the corner of Hwy. 9 and Ute PARK road. Bring gloves, wear sturdy shoes, sunscreen and bright colors. Orange vests, garbage collection bags, doughnuts and O.J. will be provided. For more information or to RSVP, email friendsofthelowerblueriver@gmail.com. JUNE 2nd-3rd, 2018: 18th Annual River Festival. Get your PFDs and dancing shoes ready…the Annual River Festival is back with a full weekend of fun! Join them on June 2nd at the Paonia River Park for the River Festival featuring live music, family fun, vendors, food & drink, games (including the ever popular fruit toss), and so much more. Then, join them for a raft on the Gunnison River on June 3rd! For more information, including registration, click HERE. JUNE 5th or 6th, 2018: 2018: Denver Urban Water Cycle Tour #1 & #2 - Sand Creek Waterway. Join the Barr Milton Watershed Association, WEco, Metro Wastewater Reclamation District and the Colorado Stormwater Council for a fun day learning about the history of the Sand Creek Waterway and efforts to restore it. This roughly 9-mile route will begin at Bluff Lake Nature Center. We'll then travel along Sand Creek, head downhill and west, diverting a short distance up Westerly creek before continuing along Sand Creek to Metro Wastewater. Register today - space is limited. Both the June 5 (morning) and June 6 (afternoon) bike tours are exactly the same. Register HERE for the June 5 date, or click HERE to register for the June 6 date. JUNE 6th, 2018: River Rescue Seminar. Down River Equipment is putting on a seminar to discuss the importance of river rescue. To find out more and to register, click HERE. 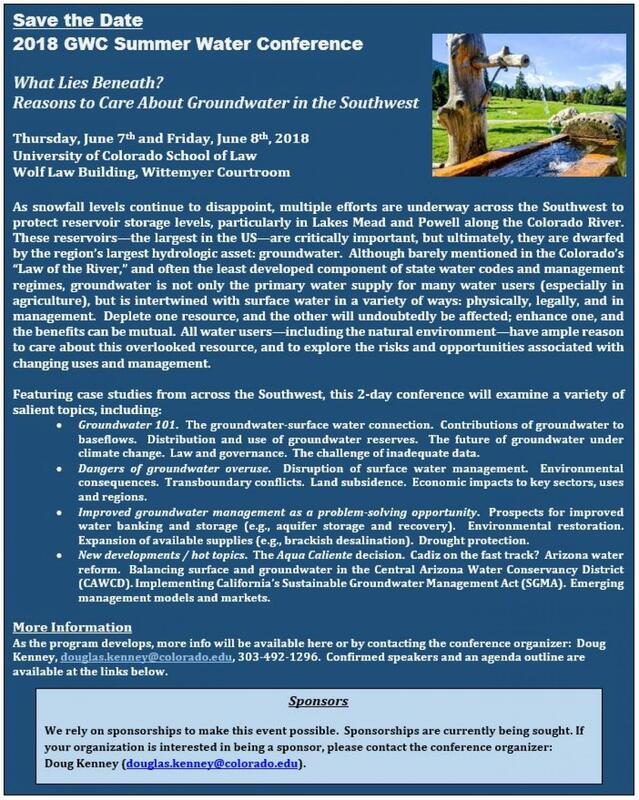 JUNE 7th-8th, 2018: GWC Summer Water Conference, "What Lies Beneath? Reasons to Care About Groundwater in the Southwest." at the University of Colorado School of Law. Read details HERE. JUNE 11th-12th, 2018: Join Water Education Colorado for their two-day RIO GRANDE BASIN TOUR! Tour topics will include the Rio Grande Basin Implementation Plan progress and priorities, forest health, reservoir rehabilitation and timed releases, remote telemetry, compact compliance, ag practices, well rules and regulations, and much more. Learn more and register HERE. JUNE 12th, 2018: Colorado WaterWise Lunch 'n Learn: Regional Model Landscape and Irrigation Ordinance. What is a Regional Model Landscape and Irrigation Ordinance? Why do we need one? How can it benefit you? Presenters will discuss the steps taken through a partnership with South Metro Water Supply Authority as they determined the need and created the ordinance. They’ll cover the key requirements and why they make sense for any municipality to adopt. As well as other great tips and tools for attendees. Learn more and register HERE. JUNE 12th, 2018: Colorado Water Trust - 10th Annual RiverBank 2018. RiverBank is the party of the year in the water community and it supports work to restore flows to Colorado's rivers in need! Join them for an evening to remember at the beautiful Denver Botanic Gardens. Learn more and get tickets HERE. JUNE 14th, 2018: Colorado WaterWise Lunch 'n Learn: Open Source Resources. Open Water Foundation is leading the effort to collaboratively develop, enhance, and maintain open source water resource software tools, to the benefit of government, universities, consultants, nonprofits, and the public. Join us for a brown bag Lunch 'n Learn with Steve Malers to learn about innovative ways to use technology to solve complex water issues and empower users with software tools for data analysis and visualization. Learn more and register HERE. JUNE 14th, 2018: Join the RMSAWWA Conservation Committee for their next meeting in Summit County. There will be a tour of Dillon reservoir prior to the meeting. Discussion topics to include connecting planning and water use demand, new development rules and regulations, and tap fees to incentivize water efficiency. Read more and register HERE. JUNE 20th - 21st, 2018: Pawnee Butte Seed Company 2018 Grass Tour. Working with the Colorado Section - Society of Range Management, West Greeley Conservation District, and Jordan Angus, together they have a great tour planned for you. Starting Wednesday afternoon: enjoy a tour of Emmett Jordan's Ranch in Briggsdale. Jordan received the 2017 Colorado Section SRM Excellence in Rangeland Conservation award. Following the tour there will be a BBQ at the beautiful West Greeley Conservation Districts Houston Gardens. Thursday join them for a day all about water. Visit different locations in Northern Colorado and see the different ways water is used in Weld County and its different forms. If you would like to join in please email becca@pawneebuttesseed.com to register or download the EVENT FLYER REGISTRATION FORM. JUNE 23rd, 2018: 6th Annual South Platte Riverfest at Shoemaker Plaza and Confluence Park. It's time! The 6th annual South Platte RiverFest presented by Elitch Gardens Revesco Properties takes place from 11:00 am - 8:00 pm. They are moving the festival back to Confluence Park for even more access to water sports and activities! Admission is free and provides access to live music, SUP races, SUP demos, and tube rides through the whitewater park. Food and beverages will be available for sale throughout the festival including a new food truck court! For more information, and to register, click HERE. JUNE 30th, 2018: 11th Annual Ridgway RiverFest. The Ridgway RiverFest is a family-friendly celebration of the Uncompahgre River and their community with all-age river races, live music, local food and drink, kids’ activities, watershed educational and cultural programs. The highlight of the day is the infamous “Junk of the Unc” race where boaters maneuver their craft, constructed from scrap materials not intended for river travel, through whitewater rapids and others’ junk, trying to keep it all intact for the 0.5 mile finish line. For more information, including directions, click HERE. JULY 8th-14th, 2018: Camp Rocky. Camp Rocky is an educational, week long residential camp for 14 through 19 year olds who enjoy the outdoors and are interested in natural resources! Camp is located outside Divide, Colorado. Camp Rocky’s professional staff helps participants learn about their environment through hands-on experiences. Students work in teams, making new friends from across Colorado. For more information, click HERE.